During the summer months there is one essential item that every person must have available at all times – Sunglasses. While temperatures are in the triples digits here in Houston, the season of sunglasses is in full effect and my sunglasses of choice have been the Switch Zealots. The first set of lenses that came installed in my Zealot sunglasses were the Polarized True Color Grey Reflection Blue. 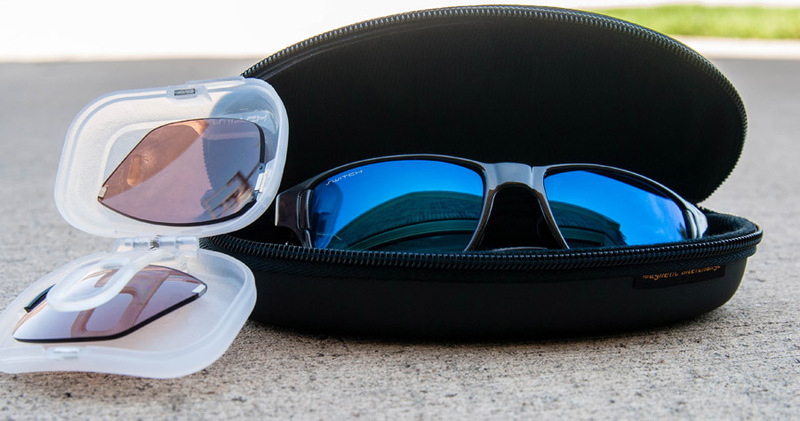 Like most high-end polarized lenses that remove the glare and haze, the Switch Polarized lenses were equal if not better than many of those high-end brands. The second pair of lenses were Rose Amber. These work best in low light situations. Clarity was simply superb and glare was non-existent, something that has always been an issue with other sunglasses in low light situations. In addition to being able to switch out the lenses, Switch sunglasses feature premium materials and classic styling. The Zealots, for example, are inspired by Wayfarers, but the styling to totally new and modern. The frames are comfortable and very sturdy, but also fashionable enough to wear out in casual or business casual functions. I knew the sunglasses were a hit when co-workers and friends would ask me where they could get a pair. If you’re seeking sunglasses that are durable, stylish, and comfortable enough for everyday wear, check out the full range of Switch eyewear.